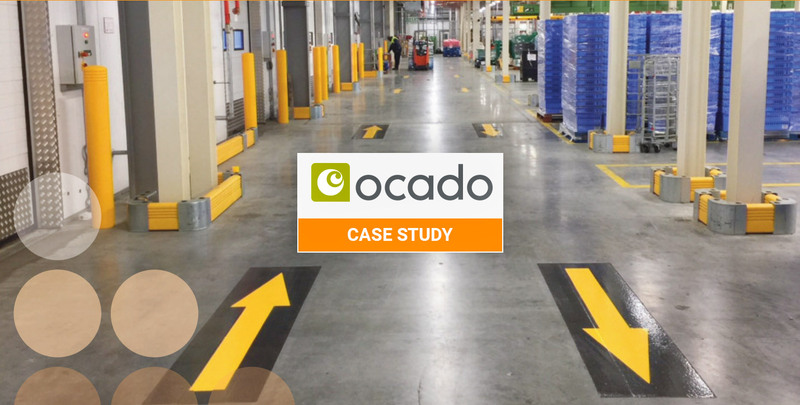 ASG Services provides line marking and clatter bar, traffic safety protection systems for Ocado, England’s leading online supermarket. Established in the year 2000 and now boasting over 580,000 active customers, Ocado is the world’s largest dedicated online grocery retailer. Its fourth Customer Fulfilment Centre (CFC4) opened last year in Erith, South East London and at 563,000 sq ft is not only the largest in its network, but is also the largest automated warehouse for online grocery in the world. Servicing Ocado’s growing customer base in London and the south-east of England, at full capacity it can process over 200,000 orders per week. It stocks both Ocado’s and Morrisons’ full range of groceries, and is divided into ambient, chilled and frozen zones. Safety is always the most prominent consideration in a warehouse of such a scale and complexity, which is why Ocado consulted with Warrington-based ASG Services – a single-source supplier of warehouse safety solutions – to explore the most suitable line marking solutions. Warehouse line marking provides powerful visual segregation for pedestrians as well as a visual guide to maximise storage areas. In an application such as CFC4, the line marking required needed to be sufficiently durable to withstand the most aggressive warehouse vehicle traffic and to retain its long-term visual integrity. ASG was able to amend the programme to work around the operation. They were dynamic and reacted if they weren’t able to gain access to a certain area and needed to change the plans at the last moment. It was very well organised. Having provided durable internal line marking for Ocado at its CFC3 site near Andover, ASG was again entrusted to provide around 3.5 km of diamond shaved line marking at Erith. Diamond shaved line marking is the most durable and accurate form of line marking available in the UK. It involves using specialised equipment to ‘shave’ an area of the concrete floor surface to a depth of 1-4mm. This removes any seal or powerfloat coating and reveals virgin concrete and a rough surface which helps the paint system to key more firmly. The line edge created during this method provides a very accurate and clean finish, significantly increasing its ability to withstand constant overrunning by materials handling equipment, and guaranteeing its performance even at temperatures of -20°C in the freezer section. Once painted, the surface is then coated with a fast-curing resin, enabling rapid handover of the site. Additionally, ASG supplied and installed clatter bars to prevent materials handling equipment such as fork lift trucks from damaging racking, low ceiling areas and doorways at Erith. Avin Pertab, Ocado’s Project Engineer at the Erith site, says he would “definitely recommend ASG to my peers”.